Marine Corps commandant says deploying troops to the border cuts the service combat readiness…. 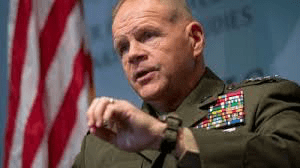 Marine Corps Boss says deploying troops to the border cuts the service combat readiness…. But it does mean that Trump ending combat troops to do non-combat missions at the border is causing the service to NOT to do some other combat readiness drills and training and use money for the border mission that was slated for other things…. “If the president won’t listen to the American people or Congress, then listen to the commandant of the Marine Corps,” Durbin said in a statement…..
Service leaders are asked to appear before Congress all the time…. The head Marine’s comments are NOT gonna go over big with the Trump White House….. But it IS important for the military to help the White House secure more money for their budget for military spending….